Temperament: Affectionate and very friendly. Jasper is a handsome young fellow who was found stray and hungry in a Regina neighborhood, living off bread crumbs in a bird feeder. A concerned citizen contacted RCR for help, and Jasper was rescued and placed into foster care. Jasper quickly showed his true colours and settled in well to his foster home. He makes friends with everyone he meets, and was a big hit when his foster mom took him to meet the students at the school where she works. 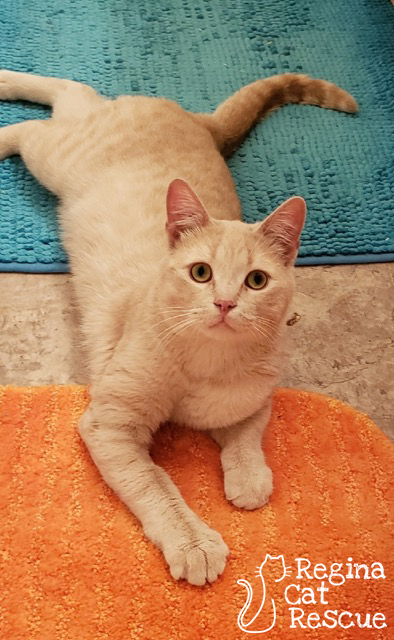 This sweet boy knows he's a lucky cat to get a chance at the good life, and he is always happy to be with people and to give and receive affection. He is laid back and adaptable, and would fit in well into almost any cat loving home. If you are interested in Jasper, click here to view our adoption contract and click here to complete an adoption application or email the RCR Adoption Coordinator at rcradoptions@gmail.com for more info.